DIYHive was created to give DIY enthusiasts a place to visit where any type of DIY tutorial can be found. By creating a collection of DIY tutorials from across the internet, we give users a better alternative of searching endlessly for the right DIY tutorial project. 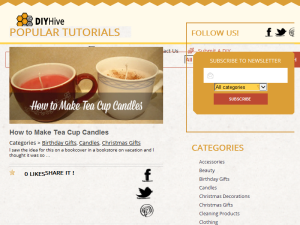 This what your DIYHive - DIY Tutorial and DIY Projects Blog Ad will look like to visitors! Of course you will want to use keywords and ad targeting to get the most out of your ad campaign! So purchase an ad space today before there all gone! If you are the owner of DIYHive - DIY Tutorial and DIY Projects, or someone who enjoys this blog why not upgrade it to a Featured Listing or Permanent Listing?